The Hunter QuietFlo 90 is a powerful but small air cleaner. It is designed to clean small rooms. It will clean the air in a 155 square foot room. This is a designed to put into a small room like a kids bedroom or a home office. It retails for $100. This model uses a true HEPA filter. It is capable of removing up to 99.97% of air born particles 0.3 microns and bigger from the air. HEPA filters, in our opinion, are the most effective type of air purifier filter. There is also an activated charcoal, or carbon, pre-filter. Activated carbon will remove odors and chemicals like VOCs. We here at All About Air Purifiers think there is not enough activated carbon to do an effective job. For serious odor or chemical removal think about an air purifier by Austin Air, IQAir, or AllerAir. There are two filters which must be replaced. The pre-filter has to be replace every 3 months. They cost about $28 for a two pack. The Hunter HEPA filter has a life on one year. It cost $85. In one year you should expect to buy 4 pre-filters for $56 and one HEPA filter for $85. The total cost is $141 a year. This is more than the cost of the air purifier. This will clean up to 155 square feet. It will do a better job in a slightly smaller space. It will work well in a room 10 feet X 12 feet. It will provide 6 air exchanges per hour. It has 3 different speeds. Don't expect whisper quiet operation at the two higher speeds. The Hunter QuietFlo 90 measures 15.7 inches X 7.8 inches X 14.4 inches (L X W X H). It comes with a 5 year warranty on the motor. There is a 1 year warranty on the grill and cord. Shipping to the factory has to be paid by the customer. 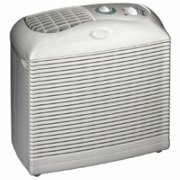 This is a good air purifier to use in a small room. We like the HEPA filter. It will do a good job of removing particles and allergens from the air. We don't think the small amount of carbon in the pre-filter will do much if anything for odors and chemicals. We feel the Hunter QuietFlo 90 will do a good job for everything else though. We also don't like the maintenance cost. It cost more per a year to change the filters than it cost to buy the air purifier. For this price you might as well buy a new purifier each year. Overall, this is a good air purifier for allergy or asthma suffers. It will do a good job in a small room. We don't recommend it because of the high cost of replacement filters. We just can't think of a reason to buy an air purifier that has such a high cost for replacement filters. Leave Hunter QuietFlo 90 Page and Return to Hunter Air Cleaners. Leave Hunter QuietFlo 90 Page and Return to All About Air Purifiers Home Page.